The first phase of the Second Avenue subway will open to the public on Monday, Jan. 1, 2017, Gov. Andrew M. Cuomo said. The governor made the announcement on Twitter Monday morning: "We believe in the team, and that’s why we’re saying we’re going to open the 2nd Ave Subway Jan. 1." In keeping with the original Dec. 31 deadline, an inaugural ride will be held on New Year's Eve. Regular service will begin the following day at noon, Cuomo's office said, with the first Q train leaving from the 57th Street-Seventh Avenue station. Q trains will run every six minutes between 6 a.m. and 10 p.m. for the first week. Overnight service will start the following Monday, Jan. 9, Cuomo's office said. The idea of a Second Avenue subway has fired up the imagination of New Yorkers for a century, as commuters along Manhattan's transit-starved East Side dreamed of an easier way to travel up and down the densely populated borough. But over time, the line had achieved near-mythical status for the snail's pace at which work has proceeded. First proposed in the 1920s and canceled three times for lack of funds, the line will replace elevated trains that ran down the East Side until they were torn down in the 1940s and 1950s. "It's probably the most important thing that's never been built in Manhattan, and now you can't say that any more," said Gene Russianoff, staff attorney for the Straphangers Campaign, a transit advocacy group. Construction on the new subway line has long been delayed, and up until recently the project’s independent engineer, Kent Haggas, had expressed concerns that the Dec. 31 deadline would not be met. Although Haggas said last week that an intensified construction schedule has now led him to believe the first phase of the project can be completed before the year ends, MTA officials were hesitant to offer a specific launch date. 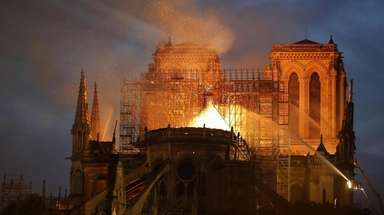 In November, Prendergast alluded to the possibility the date might change, citing logistical and security challenges that a New Year’s Eve launch would pose. But Cuomo then stepped in, vowing the project would launch on time. 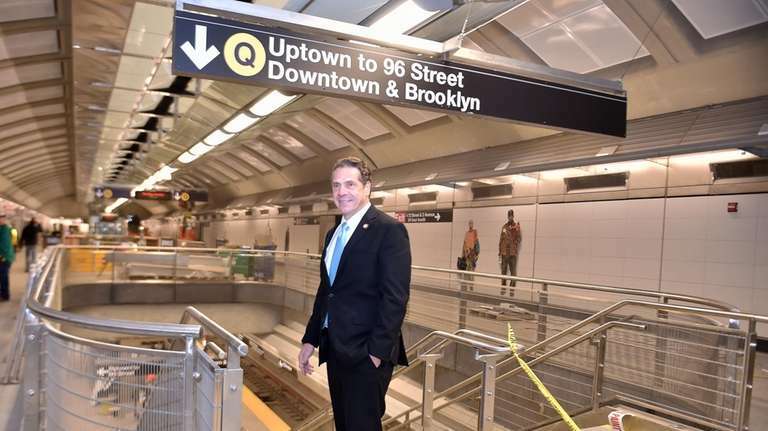 Just a week before the official announcement, the governor toured the Second Avenue subway and expressed his confidence in finishing the project on time during a radio appearance on "The Cats Roundtable." The first phase of the $4.5 billion project broke ground in April 2007 and includes three new subway stations on 96th, 86th and 72nd streets, as well as an expansion to the 63rd Street-Lexington Avenue station. When all four phases are complete, the Second Avenue subway will span 8.5 miles from 125th Street in Harlem to Hanover Square in lower Manhattan. "The Second Avenue subway is the most significant addition to our system in 50 years and will serve more riders on opening day than Chicago, Washington, D.C., and Boston transit systems combined and will significantly reduce crowding on the Lexington Avenue line," Prendergast said in a statement on Monday. "Opening the line on time could not happened without the support of Gov. Cuomo and the round-the-clock hard work and dedication of the thousands of men and women on this project who made this opening possible." The new line is expected to ease ridership congestion on the 4, 5 and 6 lines, which carry 1.3 million riders daily. The first phase alone will serve over 200,000 riders per day, Cuomo's office said.